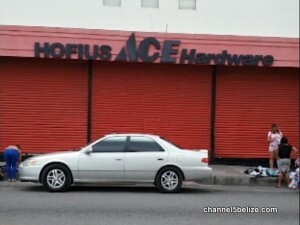 One of the biggest department stores was jacked today in downtown Belize City. The brazen robbery took place during the lunch hour when Hofius on Albert Street was open for business and customers were purchasing inside the store. Two men entered the premier hardware and houseware dealer at twelve-forty-eight p.m.; one was armed with a point thirty-eight pistol, which he used to threaten one of the cashiers on duty. His partner in crime proceeded to access the cash register and took over a thousand dollars in cash and some cheques. The robbery happened in the blink of an eye, before the criminals fled the store. Luckily no one was injured during the crime. Police have not made any arrest.